I'm having a big concern for my breed. In the Netherlands it is at a terribly low point. I myself am always being critisized because I seem to have a different type. But my dogs have a wedge shaped head, and can move, they have no narrow underjaws. Why pick on my dogs. I see way to much dogs winning with head that are triangular shaped instead of wedge shaped, they have way to much stop. They have terribly small eyes, not like sweet expression at all. Ears that are on the side of the head instead of on top of it. And I could go on further and further. I'm very happy that the dogs in the picture of good hocks are all mine, the bad ones are photo's we made ourselve. I do not claim to have the best dogs, but I know they are not as bad as too many people say. I know how a collie should look, and It should not look like some kind of deformed animal. 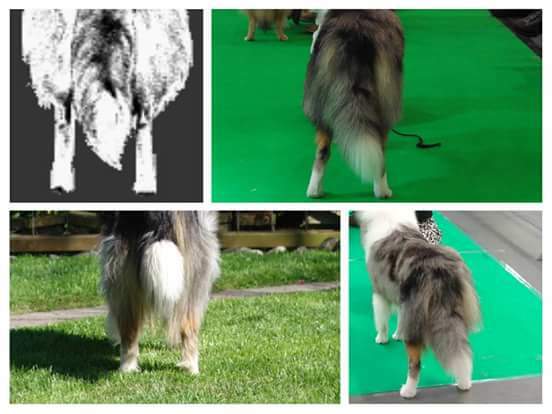 This is a line I got from a breedstandard "A cowhocked dog or a dog with straight stifles is penalized" and they win over and over, and they breed from it over and over. Did you now also that our breed is in breedwatch??? of the English Kennelclub??? yes they are and what do judges need to look for?? I don't say I know it all, but I can see things, and it is too dissapointing to see that people point their fingers. I'm still learning, and I ask alot of questions to many people I trust in the breed. 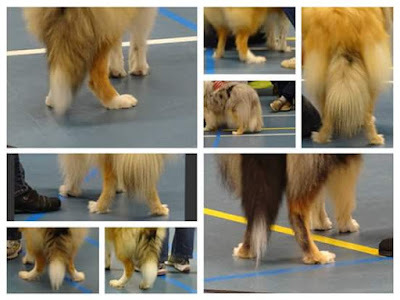 and I've been to the UK many many times, and I know that there are a lot of collies over there that are not in my taste, but I also know that the breed gets better over there, I've seen people doing great things in the breed.